Today, Hampden District Attorney representative James Leydon confirmed that the female who died in the train crossing on Memorial Drive just after 2 a.m. on Saturday was a Springfield resident named Kenisha Forbes. Further details establish that her Sport Utility Vehicle crashed into the rear of the train as it was barreling down the tracks. The Motor Vehicle Homicide Unit of Hampden District Attorney’s Office, in conjunction with the Springfield Police Department are looking into how this could have occurred. A few candles and rubbish mark the site of the accident. Practically every few hours there is a train-car collision in this country. A responsible driver should only venture onto train tracks at designated crossing locations. These are marked by lights, signals, and crossing arms. Safe driving near a train and train tracks also means being on alert and avoiding distracted driver habits such as use of a cell, turning the radio down, and respecting the power of the train requires giving it several miles to come to a complete stop. All drivers should understand that if it is dark outside, or the weather makes it hard to see, the train’s engineer will not be able to respond as quickly to items in the train’s path. This means giving the train even more time to come to a complete stop. Sometimes a vehicle operator can do everything right, crossing at the right location and following the safety signals, yet still have a collision with a train. In these instances, it may be the fault of the train operator who may have been too distracted to stop in time. 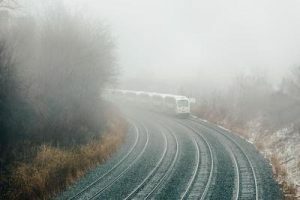 The train operator may also be the victim where the train, or the tracks were not properly maintained in such a way to avoid a train vs. car accident. If you or a loved one is the victim of a train collision where you were not at fault, call the Law Offices of Jeffrey S. Glassman at (617) 367-2900 and tell us your story.